While plastic injection molders will help you determine the size of the machine needed to get the best result, a project designer or engineer will get a good estimate based on some basic information. By knowing approximately what size machine will be required, you can better source a plastic injection molder that will meet your needs. At Rodon, we have a variety of presses to accommodate our broad base of industries that we serve. Recently, we added six new Nissei hybrid presses to our facility, bringing our total up to 117. How are molding presses rated or classified? Another factor to consider are the different types of injection molding machines available —hydraulic, electric, and hybrid. We cover the advantages and disadvantages of each in this previous blog post: Hydraulic, Electric, and Hybrid Plastic Injection Molding: Which Process is Right for You? How much clamping force or pressure is required? Many plastic injection professionals use a general rule of thumb of 2.5 times the surface square inches of the part to be produced. So, if you have a part with 42 square inches, then you would need a press size with 105 tons of pressure. If you add 10% for a safety factor, you will need to use a press with a minimum of 115 tons of clamping force. A press size of 120 tons would be able to accommodate your plastic injection molded product. How can I identify a molder that is right for my project? Once you have an estimate of the press size, you will need, you can identify plastic injection molding companies that will meet your requirements. In general, molders with a greater number and wider selection of press sizes will be able to accommodate the needs of your project. 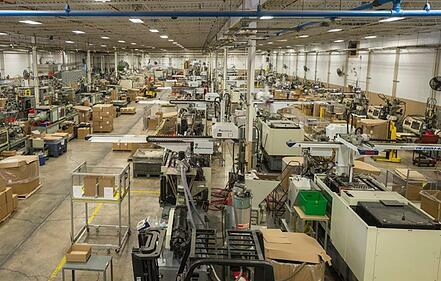 Look for a turnkey plastic injection molding company who can design, build, and run the mold. They will have a better understanding of how to maximize the manufacturing process and will often offer tooling allowances, helping to minimize the overall cost of your project. The Rodon Group has been in the injection molding business since 1956, and we have grown to one of the largest family owned injection molders in the country. Located in Hatfield, Pennsylvania, we specialize in high-precision, high-volume plastic part manufacturing. We have experience with over 800 polymer compounds in products that span the medical, food and construction industries. Take advantage of our expertise and allow us to help you with your next project.